Valentina Bonizzi: When dealing with art and politics in your book, The Migrant Image, you argue that art can ‘move’ the world. Why did you decide to call it The Migrant Image and how does this title relate to such movement? TJ Demos: I chose the title in part to counter expectations that the book concerns images of migrants, as if it’s some kind of study of the photojournalistic or the sociological. In fact, it’s a book that looks at a range of artists who investigate migrant experience aesthetically and politically by uprooting images from any kind of secure or conventional representational logic. There’s a focus on moving images, in other words, film and video, but also on images that “move” by means other than the informational, didactic, or pedantic; they move on the level of affect as a result of experimental aesthetic construction. Images today are also subjected to an unprecedented level of mobility, of course, through the transformative capacity of digitization and new modes of internet distribution. Before this technological revolution, we lived in a world of images that were far less reproducible and exchangeable, contrary to what Benjamin diagnosed. It’s become increasingly easy—beyond what Benjamin could have imagined—to take pictures and manipulate them, upload and disseminate them online. The Migrant Image investigates not so much that situation, but rather the larger condition of mobility that defines it and that determines the condition of much artistic imagery today, but without losing the social, political and economic framework of migration at the same time. So the title brings together the logic of contemporary image production with the social politics of migration. Do you find that this engagement resonates with your practice as an artist, concerned as you are with migration, and in particular the modern diaspora of Italians, which connects to your own background as an Italian living in Scotland? VB: It does in different ways. First as a photographer I am very conscious of the time that is inherent in photographic practice. I believe that a displaced person, a migrant, always experiences two coexisting images, one sitting next to the other, both have the same depth of field. The only difference is that one image is still and the other one is moving. I first practiced this concept with my video work Timeology (2010). In all my works, Il Gancio (2012) and Quotidiana (2013) I always take a moving and still image of the same subject. This process of juxtaposition of images is very similar, I think, to what happens with what you call ‘the logic of contemporary image production’, where we constantly ‘live images’ that we do not experience anymore, or never have. These still images are constantly present in half of our visual experience of life, whereas the other one moves, as we live. I believe that this process allows imagination to be part of our everyday reality. Regarding the modern diaspora of Italians in Europe, the juxtaposition of images is more related to what you refer to as ‘the social politics of migration’. Because of an unsustainable movement through cheap flights and open boundaries in Europe we think we are ‘free’. Yet this sense of freedom is fictitious, in my opinion, for two reasons: firstly, because it is a one-directional freedom: it is very difficult for me to permanently return to Italy, but I can easily go back and forth. Secondly, this movement sometimes conceals the reality that Europe has very secure boundaries, especially from the point of view of someone coming from outside the European Union. We therefore need to reinvent an image of ourselves in full awareness that the resources that enable our movements are relative and temporary. From here I would like to refer to the prelude of The Migrant Image, where you discuss the work of Walid Raad, writing that ‘…the deepest understanding of reality, particularly a traumatic one, necessitates an engagement with the fictional and conflictual aspects of images. This realization allows me to situate this work on the cutting edge of globalization’s system of images, wherein the representational link between sign and referent has been severed and truth must be reinvented on the grounds of uncertainty.’ Can you unpack this passage and tell us about what you mean by ‘truth’, ‘ground’ and ‘uncertainty’? TJD: The book project and the artists whose work I investigate comes after a development within artistic practice that’s commonly referred to as postmodernism. During the 80’s and 90’s, theorists and cultural practitioners widely proclaimed the end of truth regimes and master narratives, which accompanied a transformation in the artworld toward a concern with fiction, spectacle, and the reality of manipulated images. This became a new ‘ground’ of reality. I started to think that such claims had gone too far, that there was too much celebration of fiction, as if reality had been totally eclipsed by imagination or spectacle, and that this move had brought forth the complete abandonment of truth within political, social and economic experience. I felt resistant to such abandonment. So within this project I’ve tried to work through these questions and develop ways to return to the category of truth, but one different from the truth so criticized by theorists like Baudrillard and others. What would this model of truth be? For me it’s informed by what Foucault refers to as ‘the politics of truth,’ a truth that isn’t about verifying one form of representation by comparing it to reality, but instead a form of truth that is transformative of the self, that is contingent, ephemeral, subjective. In this regard, this new modeling of truth, for me, corresponds to your work’s relation to social and political reality. It’s not based on some imaginary construct, nor on an objective condition of information or knowledge, although that documentary presentation is not completely absent either; rather, your photographs and videos express, in my view, a subjective, contingent, and imaginative connection to past experience, to the lives and experiences of past migrants. Your photographs show figures who are Italian migrants posing in uncertain environments, but they limit our view of their subjective conditions to a momentary glimpse of their visual appearance in a geographical context that is not identified. These images have a certain resistance to identification that sparks my curiosity. 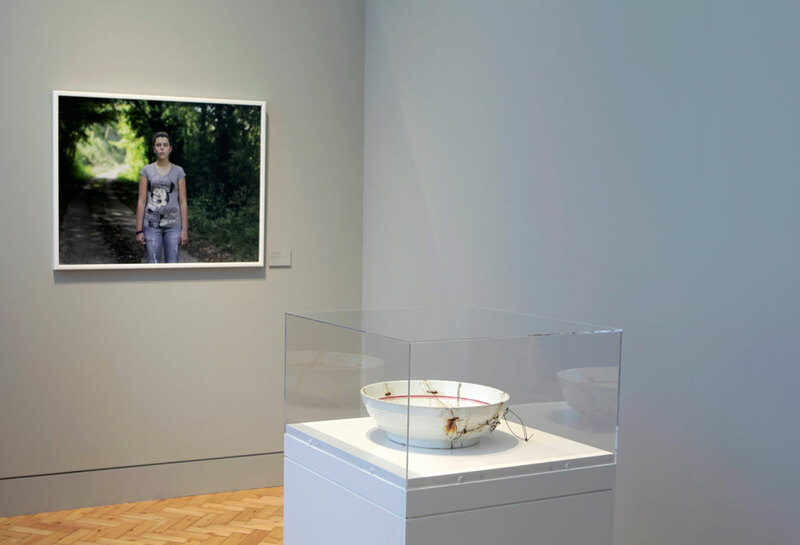 These are shown alongside historical objects that you’ve situated in the gallery space, such as a ceramic bowl carefully sewn together with wires according to traditional methods of repair. These memory objects become stranded in time. They offer intimate portrayals of material conditions and migrant experience, but at the same time operate to de-contextualise the viewer’s own position in relation to them. We, as viewers, don’t know the full stories of these figures and objects, only partial biographies, and we are consequently displaced from our expected position of security and knowledge. Such works are ‘transformative of the self’ in the sense that they bring about a shift in perspective, whereby the viewing subject confronts his or her own loss of subjective mastery and condition of certainty, even if under temporary aesthetic conditions. They also gain new historical experience, from the viewpoint of others, even while fragmentary and distant. VB: I would like to refer again to the sentence in your prelude, and respond to the way you write about ‘uncertainty’, as this might help us to discuss the trans-generational aspect in my work at the Scottish National Portrait Gallery. Today we experience ‘uncertainty’ as something double-edged. The ground underneath us is shaking, we cannot predict our future because we are constantly moving, and yet, under the same premise, we can program hundreds of possibilities for ourselves. Clearly this ‘double-edged’ uncertainty is inherent in technology. What is the relationship between such conditions of uncertainty and the narratives of older generations which still exist? TJD: When it comes to documentary representation, uncertainty and certainty are often characterized by the opposition between fiction and reality. Documentary, one might argue, represents reality; it’s about things that are actual, real, truthful, and can thus function in courts of law. It’s actionable, verifiable, forensic, a matter of testimonial witnessing. Whereas fiction is the opposite, something that you imagine, that can be invented, that doesn’t have to do with reality or truth. This opposition forms a common assumption in readings of conventional documentary practice (even if, when one looks more closely, things are far more complex). Yet in our age of uncertainty, this opposition no longer holds, especially within a larger political context of scepticism, where it feels as if you can’t believe anything that is said by a politician or reporter. The Migrant Image was written in the years following 9/11 and during the Iraq war, with the search for non-existent ‘weapons for mass destruction’. The pervasive system of governmentally produced and media-amplified misinformation is a perfect example of the existential uncertainty that we live with. As such, the opposition between truth and fiction is breaking down, but without simply suggesting a failure, or something to be warned against, but also defining a new way of reinventing the experience of aesthetics on the basis of uncertainty, which can also be liberating, historically sensitive, politically engaging, not just a matter of spectacle and misinformation. In his book Film Fables, Jacques Rancière, for instance, brings these categories of truth and fiction together, in a further act of double-edged uncertainty. Specifically, he writes about how fiction can be thought of as a mode of building reality, it can be a construction block by which you put together a credible narrative of experience and make sense of the real. Rancière’s ideas connect to what Foucault calls ‘fictioning politics,’ meaning that if something doesn’t exist we can invent it, make it exist, bring it into visibility. Isn’t this what you’re doing with your exhibition at the Scottish National Portrait Gallery? For example, I’m thinking of the excerpts from newspapers you include in your exhibition, and in particular the one that refers to the ship, the Arandora Star, which during WWII was used to deport Italians and Germans deemed enemy aliens, only to be torpedoed as it left the northwest coast of England by the Germans at the cost of over six hundred lives. The Scottish reaction in the newspaper excerpt – that Italian aliens should have been sent away in a bathtub in order not to waste such a nice British ship – expresses the inhumanity of those times, dramatizing how migrants can be objectified, dehumanized, reduced to what Judith Butler calls “ungrievable life,” that is, life denied the value of intrinsic humanity. Your presentation builds a bridge to that otherwise lost history, making it present to a new generation of viewers through the most simple of means—a framed newspaper clipping without further narration or contextualization. The newspaper cut-out doesn’t define our relation to the past in a pedantic or didactic way (as might be the case with earlier documentary practices); rather, its very condition of uncertainty seeds an anxiety and curiosity in the present that opens to a historical consciousness and to our own social reality. It provokes speculative considerations of how migrants—such as those in our midst in the photographic space surrounding the clipping—are treated today, how it might compare and differ from past eras of nationalism and xenophobia. The “fictioning” that occurs here is hybrid: documentary and imaginative, objective and subjective, processual and factual, historical and present. VB: I’d like to talk about another selection from a historical letter regarding an aliens’ ‘protected area order’ issued by the Edinburgh City Police in 1940, which I also include in my current exhibition at the Portrait Gallery. The order was issued to Frances Valente, born in Edinburgh in 1898 to Italian parents. Upon marrying a man of Italian citizenship (by birth), Frances took on her husband’s nationality, giving up her own British nationality. When WWII came about, her husband was arrested as an alien, as a result of UK policy towards citizens of enemy countries, and was deported. Frances was herself subsequently instructed to abide by the aliens’ protected area order sent to her in June 1940, (illustrated above). Frances’s daughter Rina, born in Edinburgh, was 14 years old when her mother received the alien order. She’s kept the document until today, allowing me to use it in my work. TJD: It’s a remarkable story where we see how the state produces the migrant in order to divide it from the citizen. How do you see such narratives fitting in the exhibition venue, the Scottish National Portrait Gallery, as this is a history that doesn’t reflect well on the country? VB: Well, the Gallery opened to the public in 1889, only nine years before the birth of Frances Valente in 1898, and has been dedicated since to showing portraits of Scottish people. For me, it’s been important to position images of migrants in this gallery, particularly at this peculiar moment in Scotland leading to the national referendum for independence in September 2014, when the country’s own nationality will be in contest. In my exhibition, I include only two portraits of migrants (the rest are daughters of migrants, which I thought important to show because it makes migration part of everyone’s experience), and these are of two women who came to Scotland after the Schengen Agreement was implemented, an international agreement that opened the EU to internal borderless movement. In the images, the women have their backs to the camera, which to me implies that even though there is free movement within Europe, this freedom can be fictitious and one-directional. I hung the two images in proximity in order to suggest generational episodes of stories that exist today, and to provoke new possibilities for sharing a common ground that can be a new source of identification today. TJD: The work becomes particularly provocative when set in the National Portrait Gallery, because in many ways the category of the migrant tends to undermine modes of national identity, and so it takes on a charge of dissidence. It’s exactly what national identity is not, what it’s opposed to. If you look at the terms ‘nationality’ and ’nation’, there’s an etymological connection, where ‘nacio’ gives rise to ’birth’, ‘nation’ and ’nationality’. As soon as you are born you become a citizen of a nation state, and that connection tends to naturalize the condition of nationality, as if it’s the natural condition of identity for all of us. But what about the person who hasn’t been born into a national category or has rejected that national designation, the migrant, the stateless person, or the asylum seeker? The ‘migrant’ troubles and conflicts with the logic of nationality. To bring the image of the migrant into a national collection, a metonymy of the Scottish Nation, is a complicated gesture, especially given the history that you’re talking about, when certain migrants were controlled in a war-time situation and rejected from the nation as enemies, and when Scottish people were denationalized and similarly rejected because of their ancestry and the laws preventing dual citizenship. To be forced to move from your own home by your own people, your own government, and be reclassified as alien, as an enemy is a traumatic migration story. That’s a very difficult history that you’re bringing into our present, by virtue of the inclusion of these documents, at the time when migration is a really loaded political category. To oblige the Scottish National Portrait Gallery to acknowledge this difficult moment in history when people were denationalized and thrown into this category of being an enemy alien, breaking up families, ejecting people from Scotland, requires the institution to consider the treatment of migrants in the present, to consider how nationality is at root an artificial construction, rather than an essential biological condition. VB: Scottish people lived the same experience during the Highlands Clearances in the 18th and 19th Century when people were brutally ejected from their own land by their landlords. The same happened in the South of Italy during and after the Italian Unification in the second half of the 19th century. To show individual images of people without telling their personal stories is, for me, a way to remember that we can never fully access a system of power such as the nation-state. To verbalize where we come from, our personal story of life, must by necessity be fragmentary. This is the reason why the teenagers shown in Il Gancio, both in film and photography (the latter taken straight after they were filmed for five minutes), are looking through the lens: they live today in places where they were born, whether in Paris, Glasgow or Filignano, and do not think of themselves as migrants but as European teenagers. They haven’t yet encountered this language of the migrant, but it’s part of their identity and with their gazes they seem to be questioning those who might categorize or classify them otherwise. TJD: Some theorists are quite critical of the category of nationality, and even propose the elimination of this category. Giorgio Agamben, for instance, wrote an essay called ‘We Refugees,’ after Hannah Arendt, where he attempts to identify with the condition of the displaced as an emancipatory act. He joins the two categories—citizen and refugee—together explosively, in order to cancel each out. That forms a subversive political commitment today, even if it may be an unrealizable project at present, and it’s one direction that your work could lead, with its critical questioning of the category of nationality, and its identification with the migrant. VB: You might be right. I believe that in everyday reality we need to identify ourselves with something, so at some point we need to say what are we made of. That is why the National Portrait Gallery is an important context, because it’s a point of reference for people to understand how we have been attempting to create a legacy for ourselves. TJD: But we can reject that mode of identification as well, as it might reinforce essentialist notions of identity, ones based on the exclusion of others. Our discussion makes me think of the aesthetic expression in some of your images, especially those that focus on dust in the environment, where the atmosphere suddenly thickens into a substance, a network, a stilled movement of bodies, of particulate matter. For me, it points to the fact that identity is essentially contingent, integrally related to environment, not simply its origins, but where it happens to be, its environmental context, spatially, politically, existentially. VB: The image you are speaking about, a still frame from the film Il Gancio, was placed next to the documents in order to question what is essential in the contingent. What is the relationship between the environment, the choices we have to make within it, and what is imposed because of it and our responsibility towards it? When I installed the two frames (dust and documents) I thought about the Unbearable Lightness of Being by Milan Kundera where he proposes an image of history as light as dust particles, describing what is ‘essentially contingent’ and what cannot be repeated, such as the life of individuals. I believe that the ‘heaviness’ of the repetition intrinsic to bureaucratic language can be rejected by future generations. We need this ‘heaviness’, something to reject and to take responsibility for, at the same time. That is the place where we realize our freedom, when we fight for our dreams not only against, but also within the reality of political facts, as we live. TJD: That takes political commitment, even an activist decision to reject one’s own nationality, as some migrants have done, those who burn their papers in the hopes of gaining a new identity, even at risk of death or imprisonment. VB: Would you reject yours? TJD: Well, I wouldn’t identify myself simply as an American, or accept that reductive definition, though that’s a necessarily central point of identification when I live and work in an area outside the US. I’m far from patriotic or nationalist in that sense. I’m quite sympathetic toward, and supportive of the no border movement. Open borders offer one way ahead politically that is progressive, egalitarian, just. We should struggle for the rights of residents, not for more systems of exclusion. Unfortunately, that’s not where our generally conservative governments are heading. In that sense, we’re looking at a terrible conflict in years ahead, especially with the predictions of increased migration owing to climate change, growing economic inequality worldwide, and military confrontations. VB: How would you define yourself? TJD: As I’m an American working in London, I’ve taken on a migrant identity, even if it’s a privileged one compared to others, but I realize every time I cross a border that I’m still stuck in and subjected to the category of citizenship. But how to imagine oneself as a migrant in a way that isn’t disempowering, or depoliticizing? This is what I’ve been interested in, and have examined in The Migrant Image. Your work, in my view, is significant in that it humanizes the migrant, shows her with agency. Your subjects return the viewer’s gaze, and refuse to be objectified or classified according to some identitarian system of biometrics and control. But you also point to the state’s bureaucratic language of national inscription, and also national exclusion, in terms of the designation of enemy aliens, the history of separations between migrant and citizen. This bureaucratic language has got incredibly complex in recent years, with manifold biopolitical implications, where governments control life itself in ways that are becoming incredibly invasive, debilitating (as migrants generally have limited political rights), and onerous. How would you define yourself and your practice in this context? VB: When I was in primary school I remember being very frustrated because I could not understand if I was Italian or European. They told me I was both, as if it were a bonus. I used this ‘bonus’ in the best way I could. I’ve lived in Scotland for nine years, traveling, working and studying. I also met people living in this same ‘bonus’ space, which also includes being denied an identity, for long periods of time. I’ve now decided to use the ‘bonus’ to live for some time in the rural region of Molise (Italy), to travel to Palestine and to re-learn from there. For a future project, I’m looking at the lives of Bourbons during the period leading to Italian Unification, the brigantessa (partisan) Michelina di Cesare (1841-1868) and the Palestinian activist Leila Khaled (1944). In the never-ending process of ‘defining oneself’ this is the path I am following at the moment. ‘Its origins can be traced to one enthusiastic collector David, 11th Earl of Buchan. His collection of portraits of famous Scots, assembled in the late eighteenth century, formed the foundation of the national portrait collection in its first conception… To this day, the Scottish National Portrait Gallery continues to collect works that are portraits of Scots, though not necessarily made by Scots’.